This concert is inspired by a series of 13 life-sized portraits by Francisco de Zurbarán portraying Jacob and his Twelve Sons. On loan from Auckland Castle in England, the paintings will be exhibited at The Frick Collection from January 31 – April 22, 2018. The story of the portraits is fascinating for its radical narrative. Working in Seville during Spain’s Golden Age, Zurbarán (1598-1664), a painter best known for his Christian religious subjects, painstakingly illuminated the founders of the Jewish faith. Research indicates that the paintings were intended for the Spanish territories in the Americas. At least two copies reside in Lima, Peru, and Puebla, Mexico. However, they instead were sold in Europe, eventually purchased by London banker James Mendez, whose heirs sold them to Bishop Trevor. In a remarkable statement of religious, political and social tolerance, following the repeal of the Jewish Naturalization Act in 1754, these overtly Jewish paintings were purchased in 1756 and displayed at Auckland Castle by Bishop Richard Trevor. At that time, Jews and other non-Anglican religious groups in Britain were treated with indifference, if not contempt. By surrounding his many influential guests with these imposing and exotic works, the bishop made a public appeal for social, political and religious consideration, which still resonates today. Voices of Ascension presents a program that traces the path of these paintings, beginning in Renaissance Spain with Cristóbal de Morales Lamentabatur Jacob, Francisco Guerrero ‘Sanctus’ from Missa Congratulamini mihi and Laudate Dominum for two choruses and orchestras, Alonso Lobo ‘Sanctus’ from Missa Maria Madgalene, Tomas Luis de Victoria O Vos Omnes, and a harpsichord sonata by Spanish Court composer Domenico Scarlatti. The focus shifts to The New World with Roque Ceruti’s Dixit Dominus for four choruses and orchestras with the finale in England with excerpts from George Frideric Handel's Joseph and His Brethren. Handel’s manuscript resides in the archives of Durham Cathedral. Auckland Castle remained the sole residence of the Bishop of Durham until 2010. Auckland Castle and the Zurbarán paintings are now held in perpetuity as part of The Auckland Project. View Zurbarán Masterpieces on Loan from Auckland Castle January 31 - April 22, 2018, at The Frick Collection. The American soprano Amanda Forsythe sings Euridice on the recording of Charpentier’s La descente d'Orphée aux enfers with Boston Early Music Festival which won the 2015 GRAMMY AWARD for Best Opera Recording. She has been praised by Opera News for her “light and luster", “wonderful agility and silvery top notes”. She was a winner of the George London Foundation Awards and was sponsored by them in her New York recital début. She also received prizes from the Liederkranz Foundation and the Walter W. Naumburg Foundation. Amanda Forsythe is a regular soloist with the highly acclaimed baroque ensembles Philharmonia Baroque, Apollo’s Fire, Boston Baroque and Pacific Musicworks. Her concert repertoire also includes Handel’s Israel in Egypt, Mozart’s Exsultate Jubilate, Vivaldi’s Nulla in mundo pax sincera, Pergolesi's Stabat Mater and Orff’s Carmina Burana. Praised by the New York Times for her “graceful” performance, harpsichordist Aya Hamada is an active recitalist, concerto soloist, and continuo player. She has given numerous recitals in major venues throughout Japan as well as in the US, Canada, Mexico, Argentina, Brazil, Belgium, England, France, Spain, and Italy, including recitals at the Peñíscola International Festival of Medieval and Baroque Music (Spain), Music Before 1800 (New York), the Da Camera Society (Los Angels) and at the International Conference of the Historical Keyboard Society of North America (Montreal). She has made over three dozen appearances as a concerto soloist on four continents and has performed under conductors William Christie, Jordi Savall, Nicholas McGegan, and Masaaki Suzuki. She premiered Virginal by Harold Meltzer with the New Juilliard Ensemble in 2010. Her debut album, Jacques Duphly: Pièces de clavecin, was chosen as Recording of the Month in the Music Web International (July 2015) and the Record Geijutsu Magazine (June 2015). The American Record Guide wrote, “This is a terrific solo debut…. Her control of touch and dramatic delivery are both extraordinary. Her expressiveness is especially noteworthy.” Others have praised her “acrobatic finesse” (Early Music America Magazine), and “sensitive and dramatic interpretations” (Fanfare Magazine). Ms. Hamada won first prize in the London Music Festival Competition and second prize in the Josef Hofmann Piano Competition. She earned her Master of Music degree in the inaugural class of Historical Performance from the Juilliard School. She studied under Kenneth Weiss in New York and Skip Sempé in Paris and has received additional coaching from Pierre Hantaï and Christophe Rousset. Countertenor Siman Chung, a native of Busan, South Korea, looks toward a number of important engagements in the 2017-2018 season as his career continues to grow. This fall, Mr. Chung joins the roster of the Metropolitan Opera to cover a leading role in the company premiere of Thomas Adès’s The Exterminating Angel. And in Spring 2018, he will make a role and company debut with Opera Columbus -- the title role of Orphée, in the Berlioz version of Gluck’s Orphée et Eurydice. This same production of Orphée will then be seen in Toronto. Mr. Chung made his Carnegie Hall debut in December 2015, singing in Händel’s Messiah with The Cecilia Chorus. Another recent success was in the leading role of the Refugee in Jonathan Dove’s Flight with Mannes Opera. He has also been heard with Mannes Opera in excerpts from Rinaldo, Giulio Cesare, and as Idamante in Idomeneo, during a concert evening of opera scenes. Bass-baritone Jason Eck earned his bachelor’s degree from the Oberlin Conservatory of Music and completed his graduate studies at the Indiana University Jacobs School of Music, where he sang Bartolo in The Barber of Seville, Don Alfonso in Così fan tutte, Sid in Albert Herring, Leporello in Don Giovanni, and Aye in Akhnaten. Also at IU, he was the bass soloist for Arvo Pärt’s Passio and Giuseppe Verdi’s Requiem. Eck has also performed with the Opera Theatre of Saint Louis, as The Sergeant of Police in The Pirates of Penzance, and with Atlanta Opera as Angelotti in Tosca. Brandon Hynum, tenor. 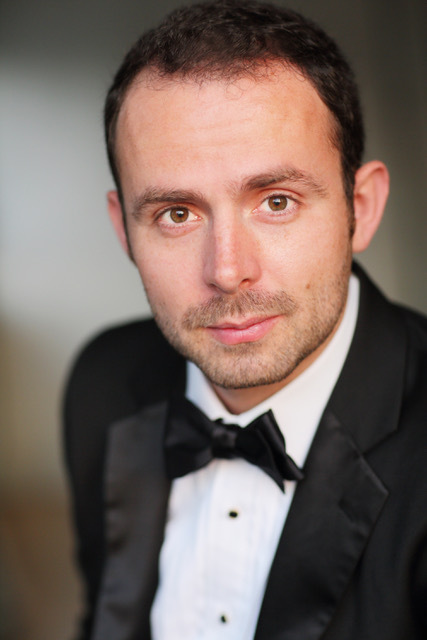 A Thousand Oaks native, Mr. Brandon Hynum is a full time member of the Los Angeles Master Chorale. As a graduate of the USC Thornton School of Music, he actively performed principal roles through the Opera Department, as well as numerous scenes (from Kurt Weil to Rossini) for various guests such as Marilyn Horne and former California Governor Arnold Schwarzenegger. Through the Music Department at Washington Adventist University, Mr. Hynum was a soloist for international tours spanning five continents.